Camping season is here! Are you aware of firewood restrictions where you are camping? Summer is here and that means camping, family vacations and fun! Many of us have memories sitting around a campfire as a child, singing songs, telling stories, roasting hot dogs and of course, making smores. As adults, watching the flickering flames of a campfire and listening to the birds chirp has a similar affect as listening to the ocean waves rhythmically hit the beach. It brings a welcome reprieve from the stress of work and every day life. Years ago, we never even thought that fires would ever have restrictions. We didn’t think twice about taking firewood with us when going to a campground or state park. Then came the Emeral Ash Borer (EAB), the Asian Longhorned Beatle (ALB) and a myriad of other invasive insects. The Department of Natural Resources of many states are doing their best to spread the word on the importance of buying firewood locally. This prevents spreading invasive insects or eggs that are riding on your firewood – often when you can’t even see them! According to a poster on www.don’tmovefirewood.org 87% of campers say having a campfire is extremely important. So don’t give up on making summer time memories! You can plan ahead by taking BIO BLOCK Firewood with you. They are made of 100% kiln-dried hardwoods and are easy to stack in an RV. Enjoy those summer evenings around a campfire and remember to take marshmellows! – Just a reminder: Keep BIO BLOCKS in a dry location! 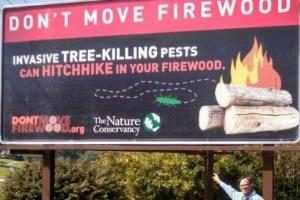 – Check out the Don’t Move Firewood website at www.dontmovefirewood.org or your state’s Department of Natural Resources website for updates on invasive insects and restrictions on firewood movement.